1 million of you have watched the video of their amazing single 'Promesas' prompting a deluge of video responses - we were all very impressed by the interpretations of the mystery animated orange boilersuit character! 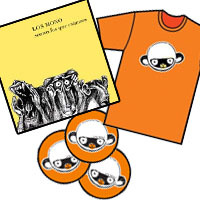 Now is your chance to purchase at a special summer bargain rate the incredible album 'Somos Los Que Estamos', the 'Promesas' T-shirt and sticker for an unbelievable $20! !